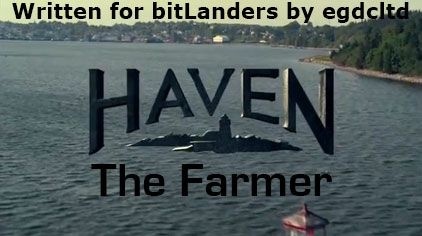 "The Farmer" is episode three of season three of Haven, a supernatural drama series loosely based on Stephen King's The Colorado Kid. In this episode, a man is found to have bred himself a whole bunch of organ donors and a Boston detective is investigating the case. This episode opens with a female jogger waiting for a man in the woods when she hears a sound. She goes in to look for him, but finds him dead with his lungs beside him. Without any incision - they apparently came out through his mouth. Only the lungs aren't actually his, but his are missing. Duke is trying to get Parker to stay off work - in the previous episode, "Stay", he discovered that the Hunter is a meteor storm which appears every 27 years, and Parker disappears again when it arrives. This is in about a month and a half. 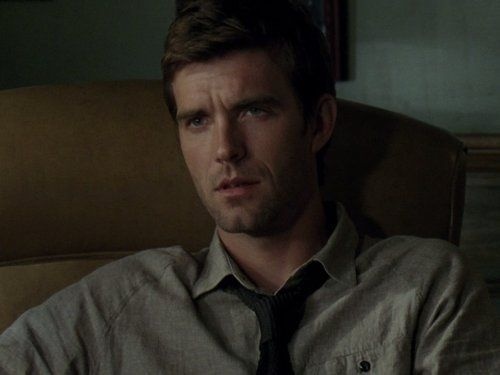 Parker hasn't told Nathan yet, but shortly has to. A suspicious-looking man taking a photo at the crime scene and who questioned a witness turns up at another crime scene, where a man has an organ next to him, and he's a Boston detective. He's tracking a killer, who killed his trainee in a similar manner, and he's tracked them to Haven. Having an outside cop interfering in Haven's Troubles is a potential problem. It turns out that the second man was killed by his sister - but the Boston killer was a man. All the organs found so far don't belong to the people found, and are all in a bad state. All of the victims were fathered by sperm donors; supposedly different donors, but from the same clinic. It seems that the father knew his organs would fail when the Troubles returned, and bred himself a whole host of replacement donors. The trouble is, of course, inherited, which means all the children have the same problem. The Boston detective thinks that they're just chasing a normal serial killer.